Riviera Sport Yacht Collection - no finer way to play There is another world that exists just out of sight from the one we inhabit daily. It is a world of wonder and luxury, friends and family, renewal, memories and joy. Here the skies have no limit and possibility knows no bounds. You can find this blessed place over the skyline but before you set out, be warned: entry is for the select few. We call this shangri-la of the senses the â&#x20AC;&#x2DC;World of Rivieraâ&#x20AC;&#x2122;, and any one of the gleaming new luxury motor yachts from the Riviera Sport Yacht Collection, the 6000, 5400, 4800, or the 3600, can spirit you there, anytime you desire. When the urge strikes, you will be travelling in enviable style. Classic distinctive lines, big wide welcoming spaces, painstaking quality and attention to detail, breathtaking modern technology, outstanding performance, structural excellence and true blue-water ability; your every need as skipper, passenger or richly entertained guest, somehow anticpated in advance. You truly are in a class of your own. Little wonder the next adventure calls. Welcome to the World of Riviera. Riviera 3600 Sport Yacht: The yacht that launched a new generation of cruising Style and good taste may be hard to define … but you instantly recognise it when you see it. At every turn, the 3600 Sport Yacht truly epitomises and expresses the excellence of Riviera. Everything about the 3600 Sport Yacht is designed to make your boating easy, relaxed and fun. From the carefully considered layout to the luxurious fit and finish of the finest of detail — and right through to the state-of-the-art technology at the helm — everything blends beautifully to ensure your precious time afloat is always a sheer pleasure. If you are in search of a luxury motor yacht that captures your heart and inspires your soul … your search is over. The forward deck of the 3600 Sport Yacht is an inviting retreat where you can soak up the sun, work on your tan or simply drink in an amazing view. Making your way forward is easy and safe — especially for children and pets — with wide side decks, high bow rail and thoughtfully placed hand rails. The large sun pad on the forward deck is cushioned and upholstered by our master craftspeople for comfort and durability. You’ll also find the proven anchoring system and ground tackle cleverly concealed in deep anchor lockers, yet very accessible when needed. The clever cockpit design of the 3600 Sport Yacht is an idyllic and indulging environment to share leisure time with your family and friends. Of course, style goes beyond looks in that it is functional, as well as fashionable. The cockpit features considerable storage, cleverly concealed yet ensuring everything is right at hand when you need it. The feeling of being in control at the helm of the 3600 Sport Yacht is magnificent. For a start, you have a clear, sweeping view. The moulded dash â&#x20AC;&#x201D; reminiscent of a luxury European car â&#x20AC;&#x201D; displays all the instruments and controls in the most considered fashion. Even those new to boating will find the 3600 Sport Yacht is a remarkably easy yacht to handle. The 3600 Sport Yachtâ&#x20AC;&#x2122;s accommodation deck is very inviting in terms of creativity, practicality, luxury and finesse. Both staterooms feature Rivieraâ&#x20AC;&#x2122;s hallmark carefully crafted cabinetry, which features matching and perfectly aligned wood grains for added appeal and polish. It is this pursuit of excellence in detail, finish and design that will make your boating experience the best it can be ... and makes the Riviera 3600 Sport Yacht the finest in her class. Natural light filters into the aft guest stateroom through long hull windows featuring tinted and tempered glass. To port there is an adult-sized single bed with convenient storage underneath, as well as an opening porthole for fresh air. Athwartships is a double bed with a thick foam mattress. The headlining has soft cushioning, premium upholstery as well as LED lighting. Riviera is at the forefront of a marine propulsion revolution, having now launched almost 500 pod-driven luxury motor yachts. Pod-drives are used on such worldly form vessels as the Queen Mary II cruise ship as well as large-scale commercial craft. This proven technology is now revolutionising pleasure yachts. Offering an excellent power-to-weight ratio, pod-drives deliver exceptional performance, enhanced torque, impressive fuel efficiency, simple maneuverability, low environmental impact and quiet operation thanks to underwater exhausts. In simplified terms, Volvo Penta’s innovative Inboard Performance System (IPS) features twin pod-drive units, each of which is capable of turning independently to provide the correct thrust to move the yacht in the exact direction required by the skipper easily controlling the system with either a steering wheel and throttles or a joystick. The 3600 has a joystick at the helm so a skipper, either solo or with a novice crew, is able to simply push and twist the joystick and the yacht will respond immediately, pivoting in place or tracking sideways into a berth that’s just long enough to fit the yacht. IPS also has the scope to enable the convenience of Auto Pilot, manual trimming with optional Trim Assist, as well as a highly-efficient AntiCorrosion Protection (ACP) unit mounted to the transom to reduce maintenance of sacrificial anodes. The innovative Dynamic Positioning System (DPS) is also an option for simple yet effective station-holding while preparing lines and fenders or while waiting off a fuel jetty. The 3600 Sport Yacht’s three-blade nibral, forward-facing, counterrotating propellers are protected by the premium anti-foul coating PropSpeed to achieve a long service life, as well as 316 marine-grade stainless steel line-cutters from Volvo Penta, for protection from ropes, fishing lines, plastic bags or nets — these precision-made line cutters create a very efficient rotating cutting action without increasing drag or fuel burn. Access to the flow-coated engine room — with acoustic and thermal insulation and LED lighting — is via a deck hatch from the cockpit. It’s here that you will really begin to appreciate the careful consideration for which Riviera is renowned globally in terms of its engine rooms. The 3600 Sport Yacht employs the revolutionary Volvo Penta D4-IPS400 propulsion system with twin D4 diesel engines and IPS10 pod-drives (2x) 221kW/301hp). Three automatic bilge pumps with manual override are located at various points throughout the hull and also pump directly overboard. The impressive commercial air intake system helps to keep the engine room temperature well below the engine manufacturer’s formal recommendation, reducing fuel consumption even further. All batteries on board the 3600 Sport Yacht are maintenance-free to ensure carefree boating and are housed in special battery boxes in accordance with American Boating and Yacht Council (ABYC) and the European Union’s CE industry standards. The confident poise of the 3600 Sport Yacht is just as evident offshore as it is at anchor — her solid and robust hull is the evolution of our rich 38-year heritage of building over 5300 world-class luxury motor yachts that are proven in the often challenging Australian offshore conditions. The 3600 has two starting battery banks comprising one battery per bank for the port and starboard engines. The house battery bank comprises two batteries, and there is one battery in the auxiliary bank. An emergency parallel function between the batteries provides increased reliability, just in case you are ever faced with a flat start battery bank. All battery banks are isolated in the saloon by remote-operated battery switches. The Mastervolt inverter provides power to the TVs and TV-lifter. LED lights provide trouble-free boating while reducing electrical current draw. The lamps use less than 10 per cent of the power required to run a bulb lamp — no bulbs mean no maintenance and long service life. Additionally, Residual Current Device/Ground Fault Circuit Interrupter (RCD/GFCI) provides protection over the entire yacht and also complies with ABYC and CE standards for safer boating. ELECTRONICS ·	A comprehensive range of factory fitted electronic packages and custom features are available with everything from radar to underwater lights. Your representative has full details. 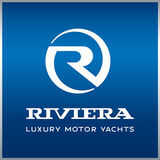 For nearly four decades the Riviera team have been preoccupied with the relentless pursuit of excellence. That means never being satisfied with the status quo, rather forever looking to improve and refine our knowledge base by embracing the latest technologies and work practices. All these endeavours are directed towards creating a superior luxury motor yacht experience for you. 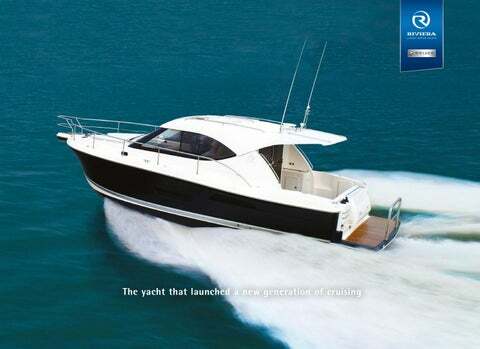 They have also garnered us enormous acclaim from the global boating industry along the way. Over the years Riviera have accumulated an impressive collection of local, national and international awards recognising ‘world’s best practice’ across the fields of education and training, employment, innovative manufacturing techniques, export, quality of workmanship and pioneering design. More than testimony to our passion for handcrafting superior luxury motor yachts, they are your assurance of ‘The Ultimate Boating Experience’ when you decide to own a Riviera. Hull Length (Lh to ISO8666) * Beam (inc. gunwale) Maximum Draft (inc. props) Dry Weight (approx.) ** Fuel Capacity *** Water Capacity *** Holding Tank Capacity *** Sleeping Capacity Cockpit Area Bridge Clearance Standard Engine Volvo Penta D4-IPS400 x 2 *Specifications may vary on a regional basis.